1. Because of the lengthy rain delay in Phoenix- my dad didn’t get to see the F35 flyover that he was so looking forward to watching. While it is not the first flyover the elusive F35 Lightning II has done at a sporting event- it is the first ever at a NASCAR event and my dad is an aviation fan. He was bummed out. I know the flyover happened (Thanks to someone I follow on Instagram) but you would think that since one of the two jets was carrying a Jeff Gordon Raceway flag you would thank they would have made a bigger hoopla out of it. 2. I watched a heck of a lot of the rain delay coverage that came out of Phoenix last weekend. More than I probably should have. But one thing I didn’t hear mentioned was who Elijah Aschbrenner was and why his name was above the passenger door on Martin Truex Jr’s car at the track. As a matter of fact very little was mentioned about it at all and I think that is a shame. Elijah was a pediatric cancer patient that was not just part of Martin and Sherry’s Catwalk for a Cause fashion show that raised money for pediatric cancer but he was known and wished well by many many many NASCAR fans and teams. Other drivers such as Kasey Kahne ran special yellow ribbons with Elijah’s likeness on them on their cars during the race as well. Elijah fought Epitheliod Sarcoma like a hero but earned his angel wings on November 10th. Here is a wonderful story about Elijah that NASCAR’s Holly Cain did it’s just a shame that they didn’t mention him (or mention him more) during the hours and hours of rain delay coverage. 1a. So Matt Kenseth was suspended for two races and put on probation for 6 months (a decision that was upheld by the appeals board I might add but the final appeal is still underway). As I mentioned I really think that Matt deserved no more than a slap on the wrist because Joey had it coming to him. But suspending Matt for what I can only assume is actions detrimental to stock car racing- is just NASCAR showing how inconsistent they are with their “penalties.” What am I talking about? Well Danica Patrick and David Gilliland have been taking turns turning each other all season (actually according to this article their issues have been going on since 2013) and Danica is docked points and fined (nothing for Gilliland). Why was she not suspended? Oh because Gilliland wasn’t in the running for a championship? And what about the whole Carl Edwards/Brad Keselowski deal from several years ago (2009/2010 here is a video I found on youtube of some of the instances I am thinking about). NASCAR did nothing in these instances. NASCAR and certain media members make it seem like retaliation never happens ever in this sport. I call foul on their “this is unprecedented” mindset. So what Matt was laps down when he made contact- I really don’t see why that matters? I still ascertain that Joey Logano KNEW Matt Kenseth wasn’t the happiest of campers with him after Kansas. Matt chose not to retaliate at Dega which was actually a smart move- that I might have had issues with because that would have been dangerous on so many levels. I still say that this is a veteran driver standing up for himself- saying look you aren’t going to push me around on the track. It’s very much you get raced how you race others. That’s how it’s always been. #NASCAR Penalty Tuesday: What #NASCAR did right…and wrong. I just want to take second to THANK everyone for all the support for the last post (the Open Letter To GMA). It was truly overwhelming to see how many of you out there not just felt the same way as I did but shared the link, shared your thoughts (either on the original post, on FaceBook, on twitter)! While I have no doubt that my letter did little in the overall scheme of things- especially judging on the ABC Nightly News coverage this evening, I like to think that us fans banding together at least showed that Tony Stewart fans NASCAR fans are not blind to slanted, biased reporting. Hopefully it somehow got back to Tony and his people that we support him on a wide scale. Onto the actual post. Brad Keselowski was fined $50,000 and placed on probation through the Phoenix race. 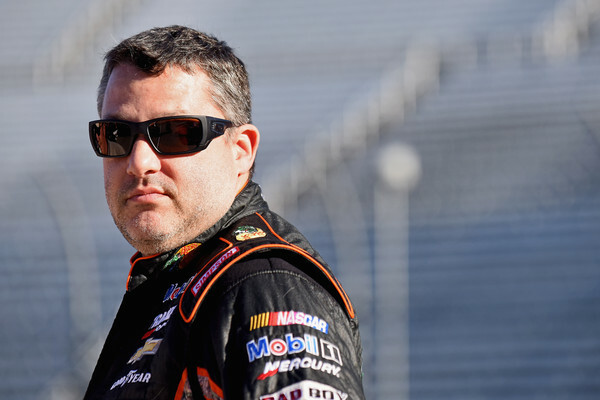 Tony Stewart was fined $25,000 and placed on probation through the Phoenix race. I know everyone has thoughts on what should and should NOT have been done with the penalties. I know I certainly do and judging by some of the things I read on social media afterwards my thoughts may not be the most popular ones. So I ask that you approach my thoughts with an open mind- and remember these are MY opinions and nothing more.